When your home is at stake, an ounce of prevention is obviously worth a pound of cure. This implies that regular maintenance is perfect for your home’s appearance and your pocket as well. Putting off the required repairs could save you money in the short-term but eventually end up costing you a whole lot of money in the long run. All roofs are prone to deterioration and will eventually need some replacement. However, the question remains; when is the perfect time to perform roof replacement? When are repairs just enough for you? The truth is that if you replace your roof too soon, you might end up wasting a lot of money and if you wait too long, you could end up with expensive water damage and roof leaks. In most cases, the decision to replace or repair a roof is quite easy and straightforward. If a single, isolated roof leak is detected that affects only a small part of the roof, a repair would be the best option to consider. However, if old age has already taken its toll on your roof, a replacement would be an excellent choice. On the contrary, roof replacement vs. roof repair is not always as easy as it sounds. In most instances, the right choice eventually trickles down to not only the damage to the roof but also the type of roofing materials you are dealing with. It is recommended that in your decision process that you consult with roofing companies in Cincinnati Ohio. Each of the roofing materials mentioned below can either be replaced or repaired when damage occurs, but their specific characteristics and life expectancy often play a huge role in helping you settle on the most cost-effective way to go. Asphalt Shingles: They are arguably the most popular roofing material option at the moment. While they are an easy-to-install, cheap, and dependable option, asphalt shingles are among the least durable roofing material on the market. Wood Roofing: While it is currently not as popular as it was some decades ago, its aesthetic appearance is impeccable. On the flip side, wood roofing materials tend to be more expensive than asphalt and need more maintenance than any other roofing materials. Metal Roofing: This option is slowly gaining popularity as a roofing material. While older metal roofing was hated for being subject to rust, too noisy during rain showers, and a bad insulator, the modern-day metal roofing gives homeowners an excellent balance of durability and affordability. Tile Roofing: This roofing option is largely common is some sections of the United States. Being very expensive and durable, tile roofing will not only give your home an attractive look but also increase its resale value. 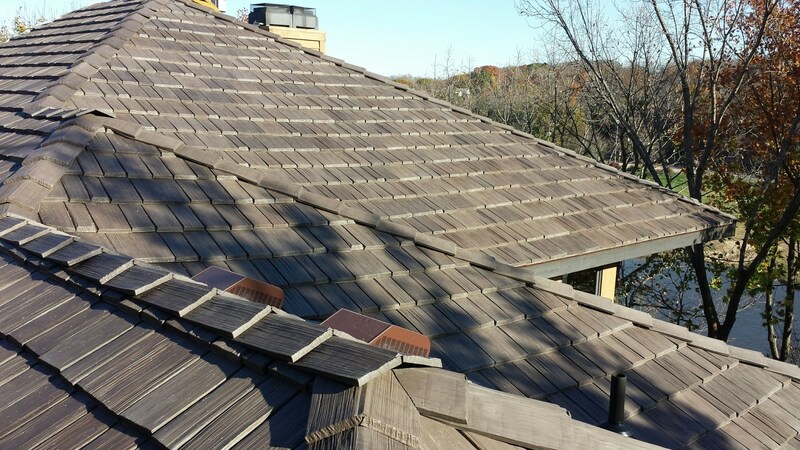 Slate Roofing: This kind of roofing is arguably the alpha and omega of all roofing materials. And regarding durability, no other material can match it. Moreover, its appearance is not for everyone and it is known to last several decades. Its surprisingly high price tag makes this roofing material an item that many homeowners find to be cost-prohibitive. Here are some guidelines that will help you decide whether you need a new roof or will just make do with a few repairs on your old roof. It is often a cause of immediate stress for homeowners when they see signs of a leaking roof on their ceiling. If you have just spotted the leak for the first time, or if the leaks are just confined to a single section, a meticulously done repair job will easily fix the problem. However, if you notice leak stains on various sections of your ceiling or some signs of moisture at various sections of the underside of your roof, it is an indication that you have a widespread roof problem and that you should replace the entire roof. Similarly, if you see one damaged or missing shingle on your roof, it is probably the right time to have some new shingles without tearing off your old roof. However, if there are dozens of missing shingles, with others looking cracked and curled, the best idea is to get yourself a new roof. As highlighted earlier, the different roofing materials have varying lifespans. Asphalt shingles are the most common roofing material and they could last close to 20 years. If you have a roof that is relatively new, less than ten years old, and you see some signs of damage, the best idea is to perform some repair works since your roof already has a significant lifespan before it crumbles down. However, if you spot the same damage when your roof is close to 18 years old, the best idea is to replace the entire roof. Even when the problem seems isolated, once your roof comes to the end of its life expectancy, you will never know when significant problems can start manifesting themselves in quick succession. Tear Off or Complete Roof Over? Once you have decided to replace your old roof, you will need to decide whether to install the new roof over the old one or whether to get rid of the existing roof completely. All in all, the choice all boils down to spending more on a neat job now and reducing future expenses or saving some money now and risking hefty expenses in future. If you already have two layers of shingles, the decision has already been made for you. You cannot put your new roof over two or more applications of any roof covering. The reason, of course, has to do with the weight and effect on the structural integrity of your home. While a shingle may not seem to weigh much when placed on your hand, covering a roof with 1,000 square feet of shingles could be equivalent to having a two-ton SUV on that roof. If you only have a single layer of asphalt shingles, you might decide to have them removed even when it is not a mandatory requirement. Doing so will probably save you a lot of money in future. For instance, if you reside in an area that experiences high winds, you should know that shingles tend to hold better when fastened directly to a roof deck. Moreover, tearing off your old shingles will let you inspect the sheathing or roof deck.